We are a well-renowned manufacturer, exporter and supplier of a wide range of the best quality Dal Color Sorting Machine that is highly demanded in food processing industry. In order to manufacture this machine as per the set industry norms, our dexterous professionals use superior quality components and cutting-edge technology. 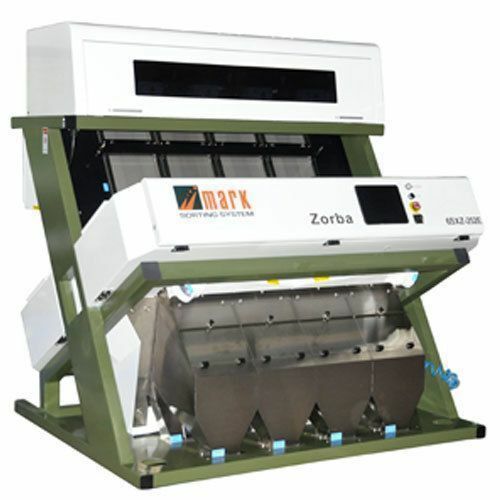 This machine is ideal for polishing various dal such as arhar, urad, moong, etc. Available in various technical specifications, we offer this Dal Color Sorting Machine at affordable prices. 5000x2 Pixel BI-Chromatic CCD Color Camera Double Side are already been adopted by majority of color sorters worldwide due to its superior performance in grain color sorting purpose. We are the first and only Indian color sorter manufacturer to adopt this camera technology and offering at competitive price. The camera and our own signal processing algorithm combined identifies even the smallest color differences and dots. Operating the Smart Jett RX is made easy with clear bright TFT LCD Touch Screen Interface Module. The Touch Screen menus has been designed for ease and simplicity of use. Fewer and simple steps of menus and parameters make the machine to suit for the variety products and give the user desired level of performance. We value your products. Every good grain ejected will reduce your profit. Minimising the ejection duration for every signal pin-point the impurity grain only and the good grain waste is reduced. Smart Jett RX is the first Indian color sorter to use the 1 milli second fast switching ejector valves operates up to 1000 ejections per second. Sorting accuracy depends up on formation of rice or grains which passes through ejection point with smooth flow is vital point of sorting quality. Smart Jett RX fitted with hardened, natural polished and seasoned alloy chute deliver the great performance, 40 Channels chute each 4.2 mm channel width ideal for smooth flow of normal grain varieties. Excellent sorting accuracy achieving by viewing the material continuously from the front side and rear side. The grain passing through the inspection area is very closely scanned by the camera for impurity. The grains are divided by vertical and horizontal lines and each individual sectors are considered. The output quality and the sorting accuracy can be set by you according to your product preference. Mark is committed to the long term success of our customers by providing high quality equipment together with after sales network required to support the grain processing industry today and in the future. To provide a high quality after sales care. Mark has continued to expand its service and After-Sales network.